On 1 July 1916, supported by a French attack to the south, thirteen divisions of Commonwealth forces launched an offensive on a line from north of Gommecourt to Maricourt. Despite a preliminary bombardment lasting seven days, the German defences were barely touched and the attack met unexpectedly fierce resistance. 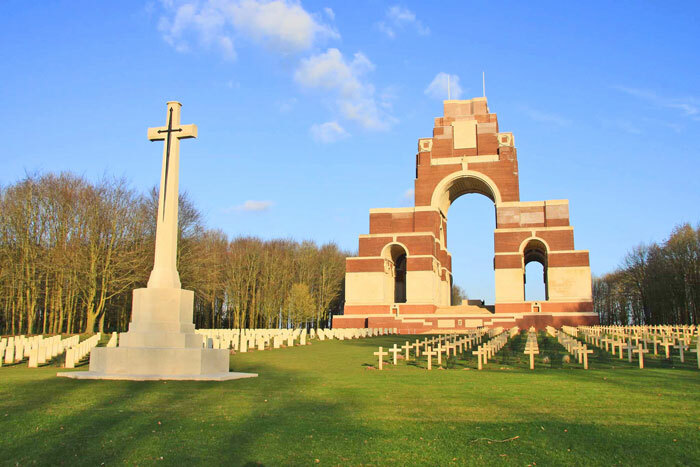 The Thiepval Memorial, the Memorial to the Missing of the Somme, bears the names of more than 72,000 officers and men of the United Kingdom and South African forces who died in the Somme sector before 20 March 1918 and have no known grave. Over 90% of those commemorated died between July and November 1916. The memorial also serves as an Anglo-French Battle Memorial in recognition of the joint nature of the 1916 offensive and a small cemetery containing equal numbers of Commonwealth and French graves lies at the foot of the memorial. The memorial, designed by Sir Edwin Lutyens, was built between 1928 and 1932 and unveiled by the Prince of Wales, in the presence of the President of France, on 1 August 1932 (originally scheduled for 16 May but due to the death of French President Doumer the ceremony was postponed until August). The dead of other Commonwealth countries, who died on the Somme and have no known graves, are commemorated on national memorials elsewhere.